In 1969 Lee Hazlewood’s personal record label LHI Records was flush with major label cash and Lee wanted to make Ann-Margret his next big star. In the quest for a hit, the pair recorded fuzzed out acid rock (“It’s A Nice World To Visit (But Not To Live In)” & “You Turned My Head Around,”) orchestral pop (“Sleep in the Grass” & “Chico”) and a genuine country album cut in Nashville. 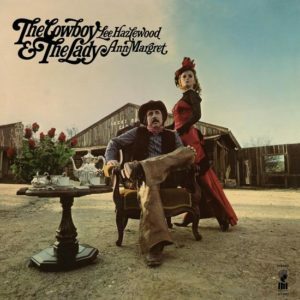 Light in the Attic Records is proud to continue it’s Lee Hazlewood archival series with an expanded reissue of Lee & Ann-Margret’s The Cowboy & The Lady. The album is Hazlewood’s truest country album and a perfect example of the genre hopping he was afforded at LHI with unlimited creative freedom and money to burn. Recorded over a weekend in Nashville with the help of Charlie McCoy and some Nashville session musicians. With improvised lines like “Look at her standing there with chili all over her dress / If I knew her better, I’d give her a puppy,” the sessions were loose and fun, with most tracks cut in one or two takes.